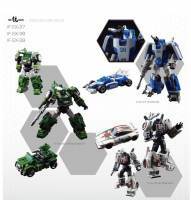 Iron Factory just announced 15 new figures on their Weibo this morning. The figures announced are in different levels of production stages, painted prototypes, grey resin and renders. 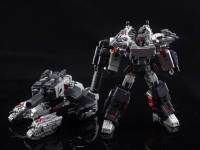 The state of production they are in generally tells how close to release a figure is, however Iron Factory is hoping to have them all out in 2019. Without further delay here is a list of what’s to come out next year. Check out the images after the jump and share your thoughts in the boards. After a over a year since their announcement we finally have colored images of Iron Factory’s Spirits of the D.E.C. combined mode thanks to Toyplus on Weibo. Spirits of the D.E.C. are Iron Factory’s take on IDW’s Decepticon Justice Division in legends scale. As of now, none of the figures are out yet but considering they are in this stage on production they should be out soon. You can find preorders for them from many our or site sponsors. 3rd Party company Iron Factory has updated their Weibo page with colored images of their upcoming release Bridge Watcher. The figure is an homage to Shockwave in the legends scale. This will be the first Iron Factory release that has interchangeable hands for different poses. As shown in the background of the image, he can be wielded by War Giant (Bruticus). Bridge Watcher retails for about $39.99 and is available for preorder through many of our site sponsors. 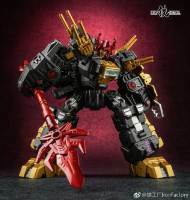 Iron Factory has updated their weibo with pictures of their upcoming IF-EX18D Lord Scorpion (Dark Matter Version). This figure is an homage to Black Zarak. The Dark Matter Lord Scorpion is a remold of their Lord Scorpion (Comic Version) that was released last year. This release has a new headsculpt along with a new weapon. The figure is due out in May and can be found at most of our sponsors. 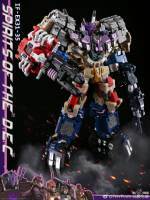 Will he be part of your pocket scale Transformers figures? Join the discussion after the jump.